I always wanted to learn how to make wontons. For years I thought they would be too difficult. I love Asian food so I had to learn. Before I could learn how to make them I had to do a little research on them. I use to be a little confused on the terminology. What is the difference between wonton and Asian dumplings? What are pot stickers? Which ones are the ones I like? These were some of my questions? 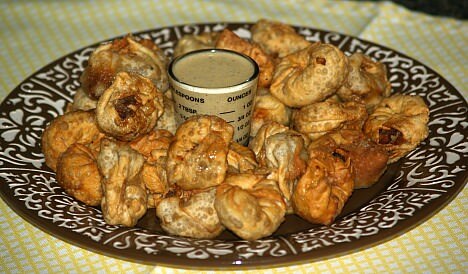 Also some of these are fried and some are steamed. Even the ones which are steamed could be processed in a steamer and some are simply simmered in water. Why all the different ways of cooking? Once I learned how to make wontons, I saw that I also was making dumplings and pot stickers. I found that all these different names are pretty much the same. All these names are in reality “dumplings”. The name “pot stickers” Is like a “nickname” given to dumplings which stick to the pot without careful cooking. Both wontons and Asian dumplings can be fried, steamed or a combination of cooking. Supposedly, pot stickers are browned first and then a little water is added for more cooking. If you do not keep the pan oiled when browning, they will stick. Also, after adding the water, they will stick if the pan goes dry. No matter what we call them, all these are forms of Asian dumplings. From my reading, it seems all the Asian dumplings are historically from the Northern China area. 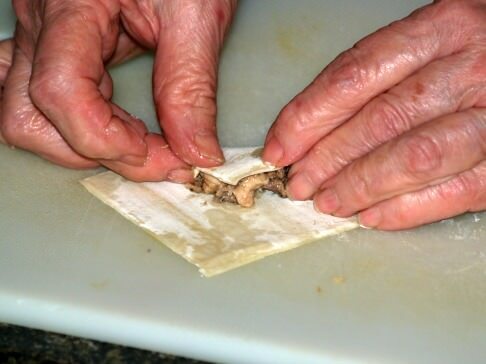 NOTE: When learning how to make wontons recipes using the round wonton wrappers, if they are not available, you can cut the square ones with a round cutter. 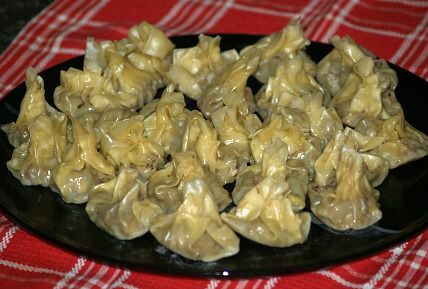 Learn how to make wontons using round wrappers. Combine pork, cabbage, celery and green onion in medium bowl; mix well. Mix 1 teaspoon oil, 1 tablespoon soy and the sherry in a small bowl; stir in cornstarch until smooth. Pour mixture over the pork mixture; toss to coat well and refrigerate for 30 minutes. Place 1 skin/wrapper on work space; keep remaining wrappers covered with dry towel. Moisten edges of 1 wrapper with water; place wrapper/skin in palm of hand. Place 2 teaspoons of filling in center of wrapper. Cup palm to bring sides of wrapper up around filling; skin will fold and pleat. Squeeze gently from below while pressing down on filling with spatula; squeeze pleats to seal. Flatten bottom slightly; continue until all are filled. Heat 2 Tablespoons oil in 2 large heavy skillets until hot; place half of dumplings in each skillet. Cover skillets and simmer for 10 minutes; uncover and cook until water evaporates. Serve with soy sauce and other favorites. 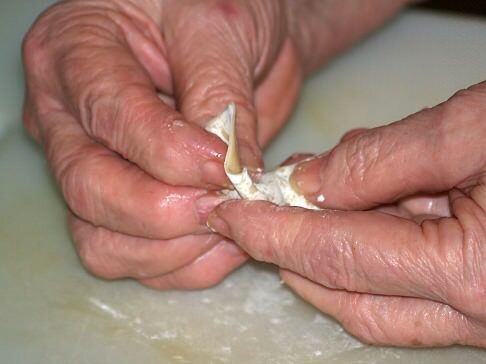 Learn how to make wontons made with scallops. Heat 1 tablespoon vegetable oil in skillet; sauté over high heat stirring until wilted. Place chives in a bowl to cool. In food processor combine scallion and ginger; pulse until finely chopped. To processor add scallops, sherry, soy, cornstarch, sesame oil, salt and pepper. Pulse mixture until scallops are finely chopped; add chives and pulse only to blend. Spoon heaping teaspoon of filling in center of each wonton skin. NOTE: Fill 1 at a time and keep the others covered to keep from drying out. Draw the sides of the skin up; pleat evenly around the filling folding down to form a little bun. After all have been filled dip bottoms in remaining vegetable oil. Place dumplings in a steamer over boiling water; cover and steam for 10 minutes. Learn how to make wontons that are crispy and delicious! Combine pork, water chestnuts, green onion, soy, salt, cornstarch and ginger; mix well. 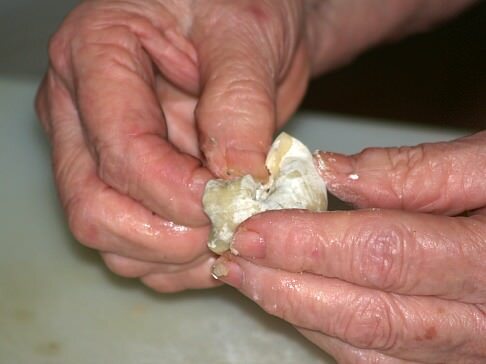 Place ½ teaspoon of mixture in the center of each wonton skin. 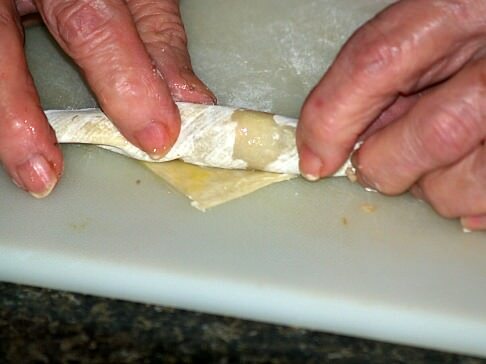 Fold corner of wonton skin over filling to form a triangle. Turn top of triangle down to meet the fold; turn over and moisten 1 corner with water. Overlap opposite corner over the moistened corner; press firmly to seal. Heat oil in a large heavy pan to 375F degrees; deep fry a few at a time until brown and crispy. Drain on paper towels; serve with favorite sauces. Combine pork, water chestnuts, onion, soy, salt, pepper, ginger and sherry until well blended. TO ASSEMBLE WONTONS place a wonton skin on work space. (Cover remaining with a damp towel). Mound 1 teaspoon of the filling in a corner or the skin. Fold that corner over the filling; roll to tuck point under. Moisten the 2 side corners with egg. Bring 2 sides together overlapping slightly; pinch together firmly to seal. Place filled wontons slightly apart on baking sheet; cover while filling remaining wontons. Pour vegetable oil 2 inches deep in a large heavy pot; heat to 360F degrees on thermometer. Fry wontons being careful not to overcrowd. Turn occasionally until golden brown on all sides about 2 minutes. Remove from oil with a slotted spoon; drain on paper towels. Keep warm until all are cooked; serve with hot mustard sauce. Learn how to make wontons that are round and filled with pork and shrimp. Broil pork chops until half cooked about 4 minutes on each side; cool to room temperature. Cut meat in 1 inch chunks; chop coarsely in food processor. Add to processor shrimp and 2 green onion; using on/off chop coarsely. Transfer meat mixture to a large bowl. Blend in jimaca, oyster sauce, soy sauce, lemon juice and sesame oil. Cover and refrigerate mixture while preparing wrappers. Roll wrappers to 6 inch rounds (You can use pasta machine if you want; I use rolling pin). 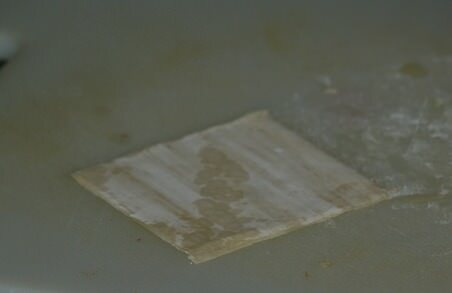 Line baking sheet with wax paper and dust lightly with flour; pat onion tops dry. Spoon filling in center of rounds; gather wrapper around filling. With onion top tie pouch close to the filling; place on prepared tray. Continue filling pouches and tying with onion tops. Heat oil in a deep heavy pan to 375F degrees. Drop in dumplings being careful not to overcrowd; fry to golden brown. Drain on paper towels; serve immediately. 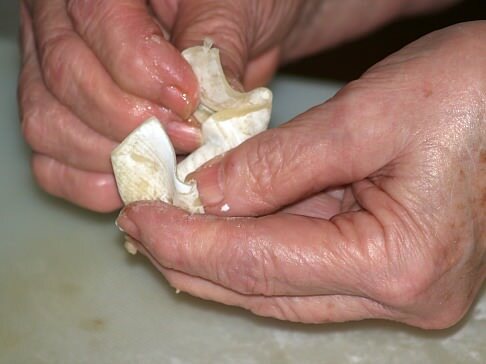 Learn how to make wontons with pork and crab with round wrappers. Beat cream cheese in medium bowl until creamy. Add pork, onion, crab, water chestnuts, 2 teaspoons soy sauce, salt and pepper; mix well. Place 1 dumpling skin on work space; keep remaining cover with damp towel. Place 1 tablespoon of filling off center on the 1 wrapper; fold wrapper in half to enclose filling. 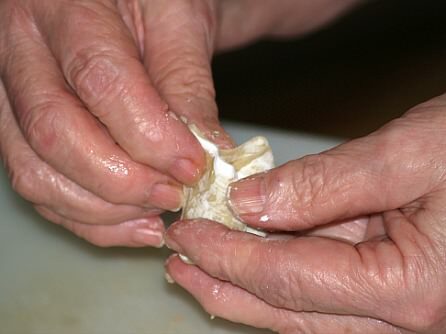 Moisten edges and pinch to seal; stand dumpling with pinch edge facing up. Press dumplings gently to flatten bottom; place on tray and cover with dry towel. Continue filling until all are done. Heat 2 tablespoons of oil in each of 2 large heavy skillets over medium heat until hot. Place half of dumplings in each skillet in a single layer not allowing them to touch. Cook over medium heat until bottoms are browned about 1 minute. Add ½ cup of water to each skillet; reduce heat, cover and simmer for 10 minutes. Uncover skillets and cook until all water evaporates 3 to 5 minutes. Add more oil if necessary to prevent sticking; cook uncovered 1 minute longer. When learning how to make wontons that are fried and other fried Asian recipes, you will love this spicy sauce. 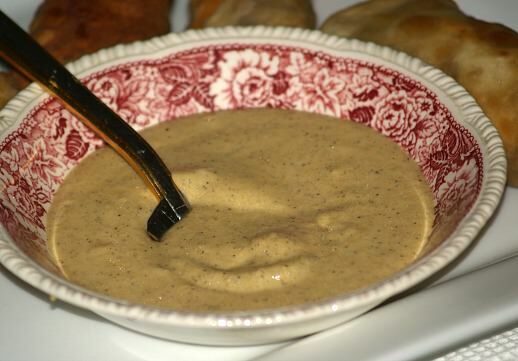 Place mustard in a small bowl; gradually stir in cold water. Stir in oil; cover and let stand for 1 hour. You will love this tasty plum sauce when you learn how to make wontons. COMBINE ALL ingredients in a small saucepan; cook and stir over high until thickened. COMBINE ALL ingredients in small saucepan; cook and stir over medium heat until mixture boils and is smooth. Heat ¾ cup water with sugar, vinegar, catsup and soy sauce until sugar is dissolved. Add pickles and sesame oil to mixture; blend cornstarch with 2 tablespoons water. Add cornstarch mixture to sugar vinegar mixture stirring and cooking until mixture thickens. When you learn how to make wontons, try making all of the different sauces to serve. Each one has a different and unique taste!